On Friday, Yosemite Sam John Bolton was on Hannity & C to help Sean Hannity try and spin the newly released IAEA report out about Iran's nuclear program to insist that despite the report's findings, Iran is now "within one year of being capable of producing a nuclear weapon." Now I don't pretend to know how far off Iran could be away from a nuclear weapon if it had a nuclear weapons program, which there is no evidence of, but if it did this news might move estimates up somewhat since the last IAEA report. DNI Mike McConnell estimated in February that Iran wouldn't have a nuclear weapon until 2015. Maybe an upcoming NIE will tell us more soon, but Bolton wanted to tell us more now. Alan Colmes: So everybody is lying about this? The Iranian ambassador is lying about it. The UN is lying. Everybody is lying about it. John Bolton: The ambassador to France. a former Swiss ambassador who was a busybody. I recommended to Secretary Powell that we get the Swiss to fire that guy or we find a new protecting power (in?) Tehran. What is he saying? Is he confirming there which he considered was a fabrication, but it wasn't, and that they didn't just ignore the offer, Bolton actually tried to get the messenger fired? It was nice to see Colmes actually press Bolton as hard as he did, and he really did, but he let that slide by without elaboration. Sean Hannity: We're talking about 3000 centrifuges, operating centrifuges installed. Would that be an accurate assessment that within one year they might be able to produce a nuclear weapon? John Bolton: That is the conventional assumption but I must say we don't know really how many Iran has. If it's mastered the technology to make 3,000 run there could be 30,000. Sean Hannity: Look, I got to tell you something if I'm the Prime Minister of Israel today, I am thinking within the next six months I have no option based on the repeated threats to annihilate my country, I've got to take those facilities out if this is true. John Bolton: Well I think the Israelis sent a pretty strong signal on Sept the 6th when they bombed that facility in Syria near the Euphrates River. If I were the Iranians I would be concerned about it. Sean Hannity: What was amazing about that strike to was their ability to sneak in. Syria didn't even know that their planes were going in. I mean this was a stunning military operation. John Bolton: And it's the same Russian radar that's been sold to Iran so it's another reason for Iran to worry. Sean Hannity: But do you think they would be able to learn from the mistakes of Syria, and do you think it's really likely that within a year that there is a chance that those nuclear facilities are going to be be taken out? 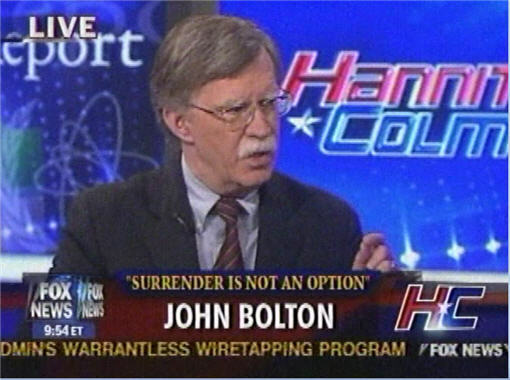 John Bolton: Yeah. There are a lot of estimates when Iran will have the bomb. They are based on good faith assumptions but you can overestimate or underestimate capability. If I were Israel I would not believe in just-in-time proliferation. Sean Hannity: I hate the fact that Israel often has to act alone. If we go back to when they took out Iraq's nuclear facilities there was worldwide condemnation in the early 1980s but it turned out that they did the right thing. John Bolton: No, Secretary of State Jim Baker in 1991 said in retrospect Israel did the right thing, yeah. Alan Colmes: Jim Baker says we've got to talk to Iran and not start a war but actually to talk to our enemies. When was the last time Iran invaded a country? John Bolton: Let me tell you something. The Iranians are pushing for hegemony within the Islamic world. They are pushing for influence within the middle east and to be a world player, and given a nuclear weapon they'll achieve it. Alan Colmes: When was the last time they invaded a country? Alan Colmes: Why isn't it an issue? John Bolton: Because what they are doing is subverting other countries without direct invasion. Alan Colmes: But they are not invading countries. They haven't taken over other countries, haven't invaded another countries at least for 150 years. John Bolton: If you can get control of country without invading, that's even better. They've got hegemony over Syria now. Alan Colmes: That means they are not likely to use a nuclear weapon then if that's what you're saying. John Bolton: No I don't think that shows it at all. They have a demonstrated record of arming terrorists as they did the Palestinian Authority. There is a very real risk if they got a nuclear weapon they would give it to a terrorist. Alan Colmes: Now, Sadegh Kharazi, who you probably know, the former ambassador Iranian ambassador to France, and somebody who wrote a 2003 offer from Iran to resolve outstanding issues between the United states and Iran which we've ignored, says there are a number of things Iran wants. They want recognition. They want us to unfreeze their assets. They want previous sanctions against Iran to be lifted. There are all kinds of areas about which we could talk to them and negotiate. There are a lot of carrots that we can use along with the sticks. why don't we go that route? John Bolton: The ambassador to France. a former Swiss ambassador who was a busybody. I recommended to secretary Powell that we get the Swiss to fire that guy or we find a new protecting power in Tehran. Alan Colmes: What about the things I mentioned about which Iran would like some recognition, unfrozen assets, aren't these negotiable areas where we can actually have some common ground with Iran? John Bolton: The Europeans have offered Iran virtually every carrot conceivable over the past four years and they've gotten one answer back from Iran: We're not going to give up our Iranian enrichment program. Alan Colmes: Didn't Iran help us after 9/11? Didn't they want to help us with Afghanistan? Didn't they offer to help the United States? Alan Colmes: So there are common, there is common ground and common interests which we can use to develop a relationship and negotiate. John Bolton: Not on the nuclear program. The Iranians are never going to give that up voluntarily. It's their trump card.